The Elegance Suite Hotel is the 4 stars boutique hotel where is situated on Bangrak (The end of Silom Road) one of Bangkok commercial and shopping districts. Which is near to the "River of King", BTS Sky train within walking distance just 5 minutes and shopping area. The hotel is approximately 30-50 minutes drive from Don-Muang International Airport depending on the day and time. 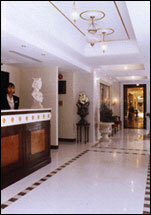 Fully service and luxurious rooms in classical style with modern facilities and all equipment for modern living. The fully furnished units feature teak cabinetry. The European interior motif sets the brand new project in each bedroom, you'll have a private working and dressing area with large closet, Sophisticated bed and rattan headboard with hand-made beside lamp. The Tropical garden in Balinese style in the roof top at 9th floor. Within this oasis of calm and splice of nature the discerning Fuse can indulge in the variety of activities, from lazily floating in the our swimming pool to an energetic workout in the air-conditioned, fitness center or perhaps join with their friends or family for relaxation to our Sauna and outdoor Jacuzzi.